When viewed holistically, as an Earth surface system driven by complex interactions over space and time between the atmosphere, lithosphere, cryosphere, and anthrosphere, the alpine snow system requires new insights into its behavior and crucial role in all mountain systems. 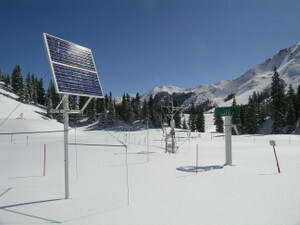 CSAS facilitates snow systems science in the San Juan Mountains and elsewhere in Colorado, including supporting a number of talented researchers and students. The following are a few examples of the interdisciplinary projects CSAS supports. 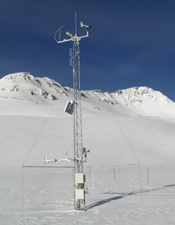 Since the winter of 2006/2007 CSAS has been hosting researcher Hans-Peter Marshall‘s NASA-funded, three-year ‘FMCW’ (snow penetrating) radar research investigating snowpack structure and SWE in the Senator Beck Basin Study Area. HP, formerly at INSTAAR at the University of Colorado, is now an Assistant Professor at Boise State University at the Center for Geophysical Investigation of the Shallow Subsurface in the Department of Geosciences. Read more on the radar news page. 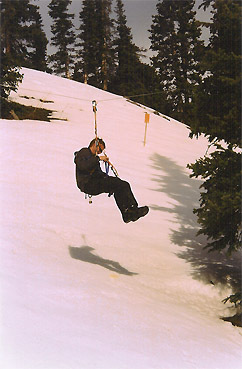 Dr. Tom Painter, now at UCLA and NASA’s JPL, but originally at the National Snow and Ice Data Center at the University of Colorado, was CSAS’s very first and remains the longest tenured hosted researcher utilizing the Senator Beck Basin Study Area at Red Mountain Pass. 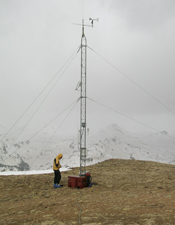 Tom and CSAS were jointly funded by the National Science Foundation to conduct a multi-year investigation of the radiative effects of desert dusts deposited on alpine snowpacks, a project that has yielded very significant new insights into processes driving snowmelt in the mountains. The ‘dust-on-snow’ theme has also resulted in a number of additional research projects that beautifully illustrate the synergistic potential of interdisciplinary snow system science, as noted below. Most recently, Tom and his graduate students are focusing their work on the remote sensing of snowcover albedo, as influenced by dust-on-snow, and using Senator Beck Basin as a calibration and verification site, with CSAS field monitoring and sampling support. See our Press page for a list of publications by the Painter team. Dr. Heidi Steltzer, of the Natural Resource Ecology Laboratory at Colorado State University, has added the Senator Beck Basin Study Area at Red Mountain Pass to her many venues for ongoing studies of plants in arctic and alpine environments. 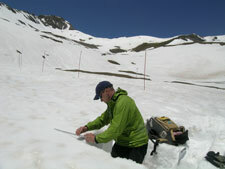 Most recently, CSAS supported her 2008 pilot study investigating how advances in the date of snowmelt might effect alpine ecology. In 2009, she published the results in the Proceedings of the National Academy of Sciences: Biological consequences of earlier snowmelt from desert dust deposition in alpine landscapes. Heidi also serves on CSAS board of directors and brings a very important perspective to our efforts to facilitate interdisciplinary, snow system research and long-term monitoring. Heidi is seen here at her Senator Beck Basin field site in June, 2008 working with her Mountain Studies Institute intern Justin Anderson, an undergraduate ecology student from the University of Kansas. 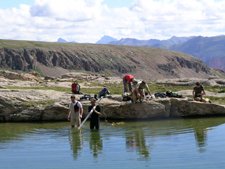 Dr. Jason Neff (on right, holding coring tool), and his collaborator Ashley Ballantyne, were assisted by CSAS in locating this alpine tarn near the Senator Beck Basin Study Area where they collected a very exciting core sample containing a 5,000+ year record of lake sediment deposition. As a result of this work, Dr. Neff et al. published Increasing eolian dust deposition in the western United States linked to human activity, Nature Geoscience, Vol. 1, No. 3, pp. 189-195, March 2008, doi: 10.1038/ngeo136. CSAS hosted and facilitated the Terrestrial Biogeochemistry Laboratory (TBL) from the University of Colorado’s Department of Geosciences in a variety of projects which complement the dust-on-snow research being conducted by Tom Painter. TBL PhD student Corey Lawrence’s dissertation helped to quantify the contemporary rate of [upwind arid land] dust deposition in the San Juan Mountains, determine the fate of the this material once it is deposited, and estimate the importance of this dust to soil and surface water biogeochemistry. 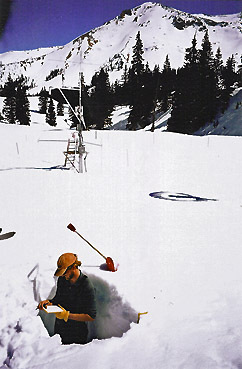 Corey is seen here installing a soil lysimeter to capture snowmelt water at the Senator Beck Basin Study Plot. 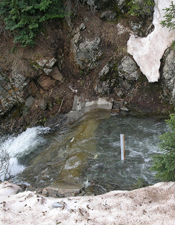 CSAS collected snow and water samples for three years, and operated an active dust collection system for the winter of 2007/2008. Corey completed and defended his dissertation in 2009. 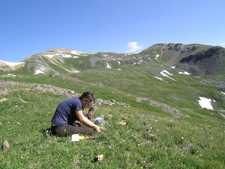 Sarah Castle completed her MSc under Dr. Jason Neff, of the Terrestrial Biogeochemistry Laboratory at the University of Colorado’s Department of Geosciences, investigating the biogechemical effects of desert dusts on alpine ecology. 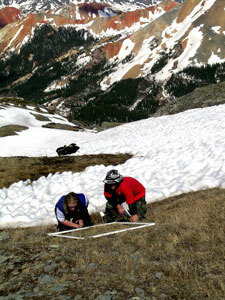 Sarah is seen here installing over-winter soil chemistry samplers in upper Senator Beck Basin. 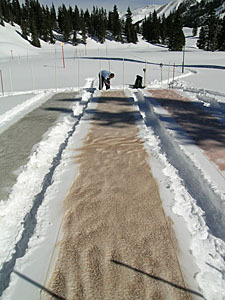 During the winter of 2005/2006 the CSAS hosted Fort Lewis College Geosciences senior Shane Stradling at the Swamp Angel Study Plot, where he conducted an experiment evaluating the effect of desert dust color on snowmelt rates (see Diary 2005/2006 ). 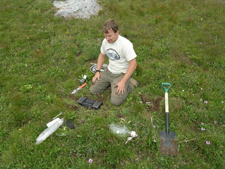 Nicholas Caselli, Fort Lewis College, conducts his Senior Project at Swamp Angel Study Plot, Investigating Snow Creep Around Melt-Freeze Crusts; Presented Results at 2004 International Snow Science Workshop, Jackson Hole, WY. Nick conducting one of his routine ‘baseline conditions’ snow profiles at the level Swamp Angel Study Plot. and then install ping-pong balls for future excavation on his SE-facing study slope.